California voters face a daunting challenge in November in that they’ll be asked to become familiar with a stunning 17 ballot measures. Some consultants fear that this will overwhelm many voters, who will choose either to vote no on everything or not vote on many initiatives. But when it comes to Proposition 55, ignorance of its contents is not likely to be a problem for voters. The California Teachers Association and its allies are likely to spend $100 million or more on saturation TV and social media ads depicting the measure as crucial to the future of California public education. Prop. 55 would extend for 12 years the temporary tax hikes on single people earning more than $263,000 and couples earning more than $526,000 that voters approved in 2012 (then at slightly lower income thresholds) as part of Proposition 30. Instead of sunsetting at the end of 2018, the income tax increase would continue through 2030. The $7 billion or more this is expected to generate annually would be earmarked for education. The temporary sales tax hike that voters also approved in 2012 will lapse at the end of this year. This month, the CTA wrote a $10 million check to the Yes on 55 campaign, which now has a $28 million warchest. The CTA and the smaller but still powerful California Federation of Teachers are likely to write several more checks that size to try to avoid the headaches that public school teachers faced from 2008 to 2012 during California’s long revenue recession. While the “step” increases in pay that teachers typically receive in 15 of their first 20 years on the job were largely protected, strapped school districts didn’t grant additional across-the-board pay hikes that many provided during recent tech bubbles that pumped up capital gains revenue for the state. They also pushed for teachers to pay more toward their benefits and in some cases accept layoffs that extended beyond the newly hired to those with several years of experience. 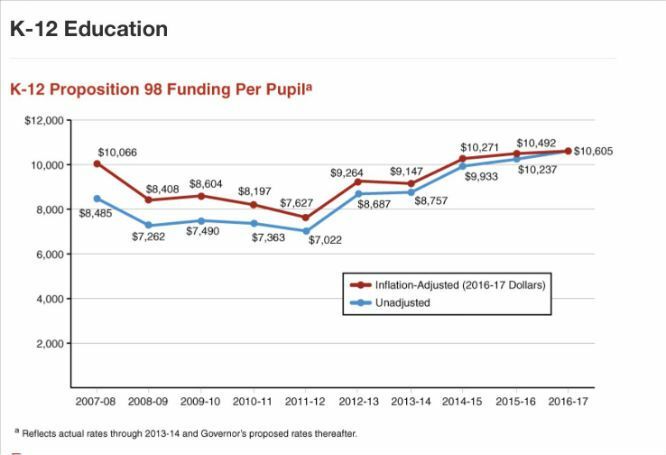 As the Legislative Analyst’s Office graphic above shows, education spending has strongly rebounded since 2012, helped by a new boom in Silicon Valley and Proposition 30’s adoption that year. But the CTA and the CFT share Gov. Jerry Brown’s skepticism that the current good times can last. After first insisting that the temporary tax hikes must be allowed to expire because that’s what voters were promised, Brown has been far less vocal on the topic in the wake of new forecasts from his Department of Finance that state deficits are likely in coming years without retention of the income-tax hike. Since state coffers are the main source of K-12 funding, Prop. 55’s approval is crucial to maintaining teachers’ pay and benefits. In most school districts, compensation eats up more than 80 percent of general fund budgets. But Prop. 55’s route to passage may be rougher than Prop. 30’s in 2012. The Sacramento Bee editorial page has already said that support for extending the tax hikes should be explicitly linked to reforms in teacher tenure and to teacher unions’ support for state-subsidized childcare for poor families. Some state lawmakers may also try to leverage their support for Prop. 55. Led by Assemblywoman Shirley Weber, D-San Diego, they are unhappy with how 2013’s Local Control Funding Formula has been implemented. The measure was supposed to pump billions of dollars in extra funding to districts with large numbers of English-language learners and foster children so they could provide help specifically for such students. But three years in, education reform groups say that’s not happening, citing the absence of evidence of additional help for either category of student. Last year, Superintendent of Public Instruction Tom Torlakson said the local control dollars could be used broadly for general pay raises, overruling a lower-ranking official.